My first attempt seemed a little too loose and stretchy. I made it again using a smaller hook and I shortened the "handles." 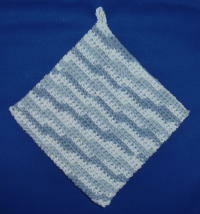 The cotton yarn still stretches quite a bit when it gets wet. I'm not sure what to do about that, but it is still a nice pattern. 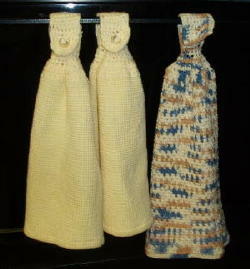 The yellow towels are a purchased towel with crocheted tops. 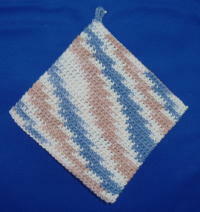 I just happened to have cotton yarn that matched the towel. 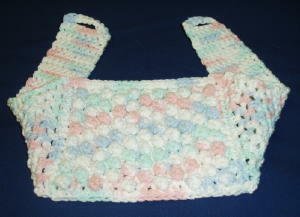 I did not use a pattern for the crocheted top. 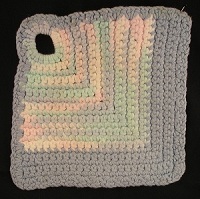 The multi-color towel is crocheted. by Roberta Maier, Crochet Digest Magazine. 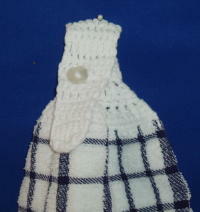 I'm not sure I like the crocheted towel. 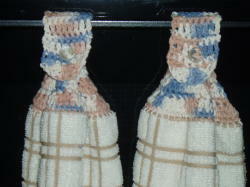 These are purchased towels with crocheted tops. my tops never come out exactly the same. 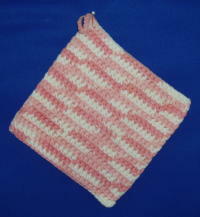 Potholders ! 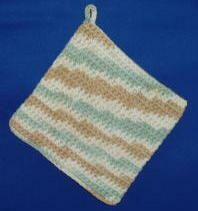 I love potholders ! 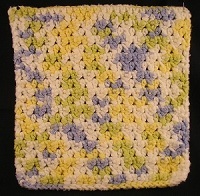 I use Helena's Potholder Stitch. 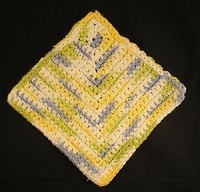 It makes a thick, dense potholder. I also like the "Magic Square." 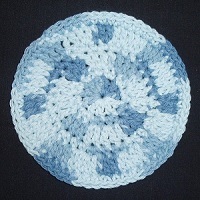 I buy one ball or two and make a potholder. 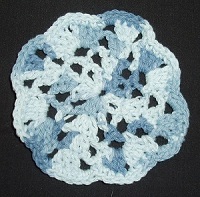 Basic Circle in single crochet Both of these are based on an old potholder pattern.